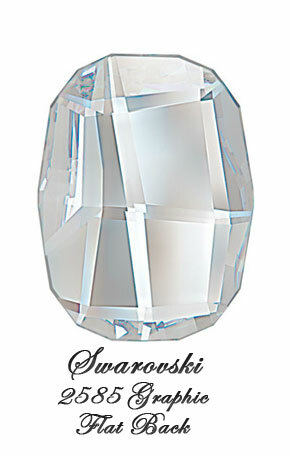 Swarovski Crystal Flatback 2585 Graphic was released in late 2011, as part of their Innovations Autumn/Winter 2012/13. The 2585 Graphic shape is an interplay between the smooth and rough, an ideal merger of the two opposites. Ideal for all unisex themes. Offers extreme versatility - a classic execution with a modern organic twist. I so happen to have on me some lovely photos of the Swarovsky Crystal Flatback 2585 Graphic in the latest effect (Crystal Luminous Green) as at Feb 2012. (Photo Credit: CREATE YOUR STYLE). This is sure to whet your appetite so be forewarned!